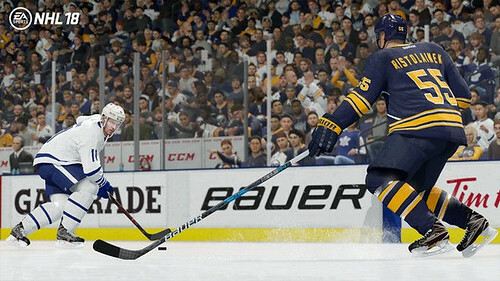 The all-new Defensive Skill Stick now gives you full control over your stick while skating to target poke checks, keep your stick extended against an attacker to disrupt a play, and even sweep your stick back and forth to cover a zone. With the introduction of new Creative Attack Dekes that give you more control offensively, we needed to implement a defensive tool that allows you to counter the control offensive players. 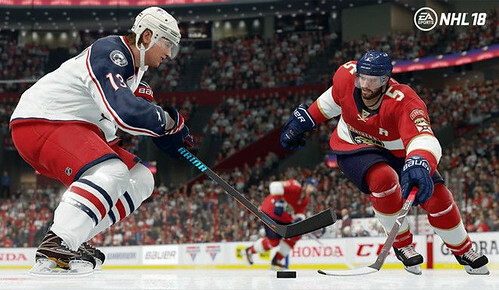 The Defensive Skill Stick provides the ability to cut off the opponent’s passing, shooting and skating lanes by pressing and holding the poke check button then using the right stick to control the direction. By allowing full control over your stick on defense, you can keep your stick extended to angle off an attacker or sweep your stick to cover a zone. Additionally, you can target your poke checks by pressing down on the right stick when you are using the Defensive Skill Stick. When you are using the Defensive Skill Stick, you cannot hit or pickup the puck. In order to do so, you need to release the poke check button and you will be able to either deliver a body check or pick up a loose puck that you poked away from a defender. When implementing the Defensive Skill Stick, one of the things we had to consider is where other controls would go. For example, the Puck Chop mechanic used to be performed by combining a poke check with a direction on your right stick. With the Defensive Skill Stick being activated with the press and hold of the poke check button and using the right stick to have control over it, we had to test and come up with a new button combination for the Puck Chop mechanic. After testing and playing around with control schemes, the Puck Chop mechanic is now accomplished by pressing down on the right stick and then pointing in the direction you want to chop the puck. The addition of the Defensive Skill Stick also allowed us to improve our one-knee shot blocks. When you are in a one-knee shot block, you can use your right stick to control your stick and body positioning to help block off passing lanes. This is most effective when you are killing a penalty as it allows you to block shots and passes while maintaining your position on the ice. The Defensive Skill Stick lets your knowledge of the game and positioning shine through on defensive side of the puck, allowing you to shut down your opponents with defensive skill.